If you’ve been mulling the latest Apple gizmo but wince at the prices, today could be the day to act. 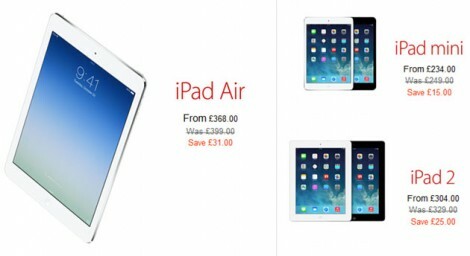 That’s because Cupertino’s offering UK discounts of up to £81 on the latest and greatest iMac or MacBook models and £31 off of the iPad Air. Other iPad models are discounted too, and you can score a deal on the iPod Touch or accessories like the Parrot AR drone. As for the US and Canada, gift cards are being handed out in lieu of cash off, including $75 offerings on the iPad Air, $150 for iMacs and MacBooks and $50 for an iPod Touch. As for the rest of the EU, other countries like France and Germany are seeing similar cash discounts to their UK counterparts on the same products. Not everything is on sale, though. For instance, the iPad Mini with Retina display is still full price. Still, if your iProduct trigger finger’s been feeling itchy lately, hit the source.